We’d love your help. Let us know what’s wrong with this preview of Lise Meitner by Ruth Lewin Sime. To ask other readers questions about Lise Meitner, please sign up. I read this book in german and it was absolutely horrible. although it wasn't the exact same version, I disliked it a lot. It was boring and nothing ever seemed to happen. There were also way too many characters..? This is a brilliant book. I have not enjoyed a book so much for years. It is the story of one of the most outstanding women scientists of the last century. A girl in Vienna in the late 1890’s, with an interest in maths and science, whose best prospects would have been becoming a French teacher, Lise Meitner beats the odds and becomes a world calibre physicist. Sime’s masterly narrative describes the incredible difficulties she had to overcome, first to get an education and later to be accepted b This is a brilliant book. I have not enjoyed a book so much for years. It is the story of one of the most outstanding women scientists of the last century. A girl in Vienna in the late 1890’s, with an interest in maths and science, whose best prospects would have been becoming a French teacher, Lise Meitner beats the odds and becomes a world calibre physicist. Sime’s masterly narrative describes the incredible difficulties she had to overcome, first to get an education and later to be accepted by her male colleagues in Berlin. Eventually she ended up working with the top scientists of the time. From Planck to Bohr, to von Laue to Schrodinger and Einstein - a very privileged situation, but one she earned through a great deal of work and personal sacrifice. Sime depicts the ups and downs of scientific research in nuclear physics and radioactive chemistry so skilfully that she had me sitting on the edge of the chair. I should confess that before I became a writer, I used to work in scientific research myself and maybe that contributed to my utter absorption in this book, but I think that most people with high school science should be able to follow that part of the story. But this book is about much more, it is about the history of the first half of the 20th century Europe, about racism and what that does to both the hated and the hater. It is about personalities and human relationships, but more importantly about ethics. When should a person abandon a career or the work they love for justice? Is there a boundary one should never cross for personal gains? Sime’s description of how the German scientists felt about Germany being defeated was utterly fascinating. That is where my sympathy for Otto Hahn, Meitner’s collaborator for many years, diminished. There is more tension in the events which lead to the discovery of fission (and the competition to be first to publish) than in most crime stories. Sime discusses in detail why Meitner ended up missing out on the Nobel Prize she probably deserved. There are a number of culprits, but I think that Bohr is far more guilty than she is prepared to say. Is it because he was a larger than life character who helped many people during the war? Surely that does not excuse the damage he caused to Meitner and Frisch-her collaborator. I suspect it was self- interest, I suspect he wanted to share the limelight. Otto Hahn remains somewhat of a mystery. He helped Meitner a great deal to be accepted in Berlin and later to get out of Germany before war broke out, but as the war went on their relationship cooled. Understandable. It seems to me that Sime tried to be impartial towards him for most of the book, but she found it hard towards the end. Maybe she is right, maybe he did change completely as a result of the war and the fame brought by the Nobel Prize, but I am not entirely convinced. In his Nobel speech Hahn did include Meitner and Frisch’s contribution. Perhaps it was low key but she was there. This book is a valuable contribution not only to the history of science, but to the history of Europe. It is the story of the scientists who pushed our understanding of the world ahead a great deal, their personalities, their competitive streaks, their ethical choices. It is the story of the courageous, and the story of the weak and self-interested. And by basing it on detailed research, Sime has produced an utterly credible and captivating story. More than just a biography of scientist. Highlights aspects of the world wars, anti-semitism, and feminism in europe that are not often discussed. Loved it. Overall, a compelling and useful biography of a less-known but very important physicist. Dr. Sime is a gifted writer, too, as well as a scientist in her own right. If you're interested in physics, the history of the physical sciences, or female scientists, it's a very good book to read. Really great book, Lise Meitner was a very inspiring woman, not just simply for the fact she was an incredibly great physicist, but also due to her ability to stay firm in her beliefs without destroying the relationships she had with others. Not an easy thing to achieve. She lived through the horrors of the two world wars - it was very saddening to read about, but, in todays climate, not an unwelcome reminder of how things can get extremely out of hand. There was a lot of insight into how it was for Germany at that time. Heavy scientific descriptions in parts - oh coz, it's about the discovery of fission :) - but shouldn't let that be off-putting, there is lots of good stuff in here, even if you have to skim over the science! Fascinating both for the scientific thrills and the slightly horrifying details of the breakdown of civilization as Europe enters WW2. It is fascinating to see how hard it was to grasp the truth of nuclear fission, and the details of how extremely difficult the lab techniques in radiochemistry were. An excellent, clearly written biography of one of the great physicists of the early nuclear era. As well as her personal life, this book gives a thorough, clearly explained descriptions of her scientific works and achievements. Lise Meitner, one of the key figures in the discovery of fission, would be more widely remembered in history if she had not been Austrian-Jewish and made her break through findings in exile, right before World War II. There is plenty to admire in her journey, from her pioneering entrance to university formerly out of reach to women, to leading the physics section of the KWI. 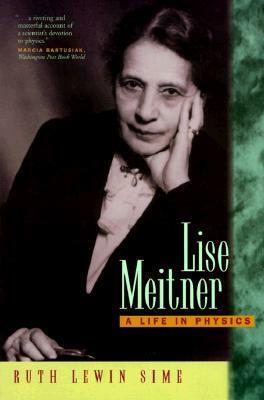 This books provides a very engaging overview of her life, bringing Lise to life, along with the historical events that mark Lise Meitner, one of the key figures in the discovery of fission, would be more widely remembered in history if she had not been Austrian-Jewish and made her break through findings in exile, right before World War II. There is plenty to admire in her journey, from her pioneering entrance to university formerly out of reach to women, to leading the physics section of the KWI. This books provides a very engaging overview of her life, bringing Lise to life, along with the historical events that marked her time. The depiction of other prominent scientists of her time, like Bohr, Einstein and Planck brings a lot of humanity to these figures. The inclusion of several letters written by Lise really make her personality shine through - her reluctance to complain about her dire conditions on the post World War I economic crisis, her struggles integrating to life in Sweden, her confidence and authority when interacting with Otto Han and directing the course of the experiments. The biographer attempst to keep a neutral stance on Otto Han, although on the final chapters, his lack of recognition of Lise's role on the fission discovery, and her exclusion from the Nobel Prize are highlighted. Well-researched account of Meitner's life and the research that led up to the discovery of nuclear fission. It's sympathetic even in taking a stance on the political events and actions that shaped Meitner's career and later life, presenting a clear picture of her scientific achievements and tracing the reasons why they remain so little-known. Moreover an inspiring read about a woman who was one of the first in science, going on to become a brilliant pioneer in nuclear physics. The science-heavy Well-researched account of Meitner's life and the research that led up to the discovery of nuclear fission. It's sympathetic even in taking a stance on the political events and actions that shaped Meitner's career and later life, presenting a clear picture of her scientific achievements and tracing the reasons why they remain so little-known. Moreover an inspiring read about a woman who was one of the first in science, going on to become a brilliant pioneer in nuclear physics. Stunning story, little told. How unjust was all THAT?! I loved the story of this woman's life presented in this book, but the description of the physics was weak. I had to turn elsewhere for that. Overall, it was a difficult read, but worth it.